KidZone Daycare Centre offers distinct advantages over other child care alternatives. 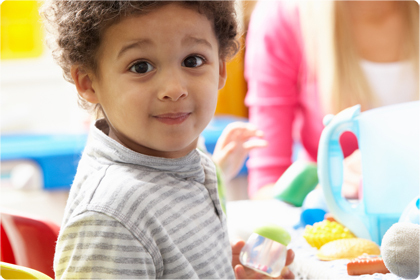 All full-time child care workers are trained and certified as Early Childhood Educators. Their education and their many years of experience makes them a very well qualified team of child care professionals. Each month through the Spring and Summer, KidZone children* get to enjoy a field trip to a local destination. Previous destinations include Storybook Gardens, The Children’s Museum, the Public Library and a local craft store, to name a few. During the cold months, special visitors come to the Centre. We’ve hosted the Snake Lady, a local dance group and various singers in the past. *Children must be able to walk and nap only once per day to attend field trips. KidZone families are invited to attend an annual summer picnic each June. Treats, bouncy slides, bubbles, music and a meal are all part of the fun. Each December, our kids perform songs on stage for their families and friends during our Christmas concert. This is possibly the most memorable event of the year. KidZone is a not-for-profit organization governed by a Board of Directors comprised of parent volunteers. We value your input and your participation in ensuring the Daycare continues to offer excellent service.